Today is the day to announce the winners of promotional codes for three apps from the Mobile Education Store; one each for Rainbow Sentences, Preposition Builder, and the new TenseBuilder. I assigned a number to each person who commented on the The Budget SLP Facebook page and on this blog. Thank you to all who participated. I used the app, Winning Ticket , to randomly choose the numbers. 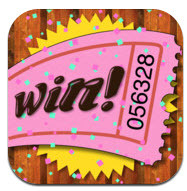 This is a good app to use when you have multiple prizes to give away! The winners are Nikki Heyman, Patti (who commented on 9/19), and Sarah Lively. Winners, please contact me at Diana@thebudgetslp.com. The first to contact me gets their choice of apps. Thank you to Kyle Tomson, president of the Mobile Education Store for the three great apps.